Today is Peter’s birthday and what a beautiful view to wake up to on your special day. 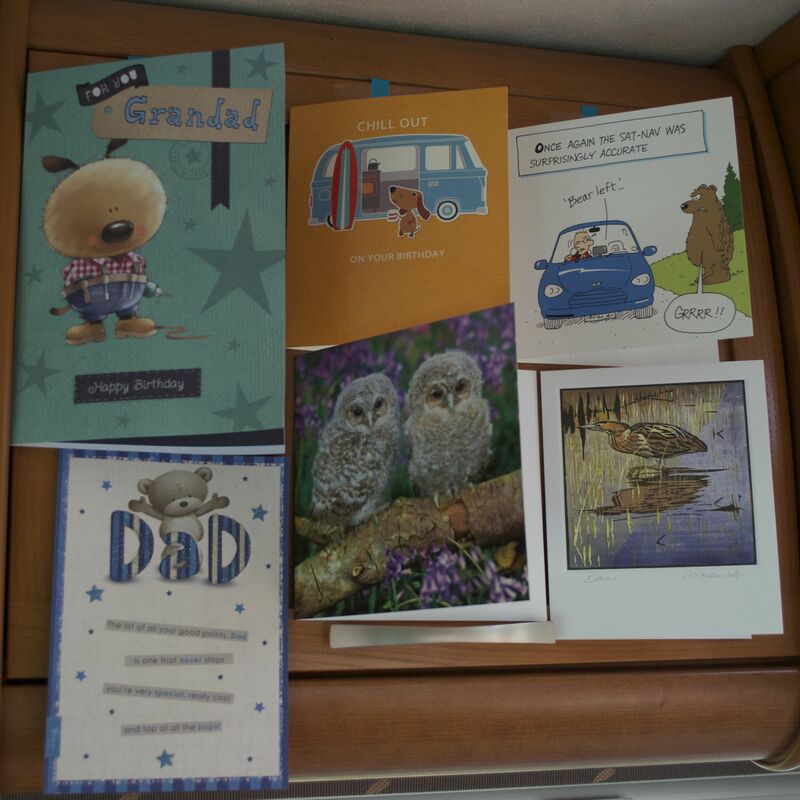 Family cards and presents are opened – thank you everyone! 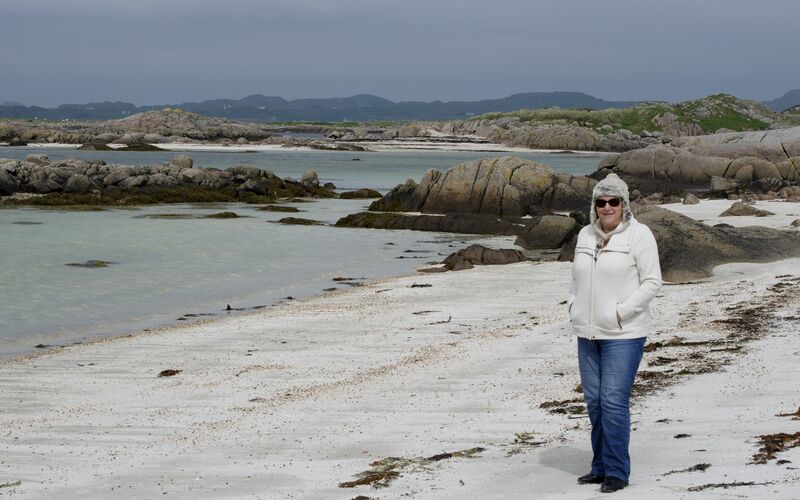 We went for a last walk on the beach before leaving this lovely place – cold but at least sunny. 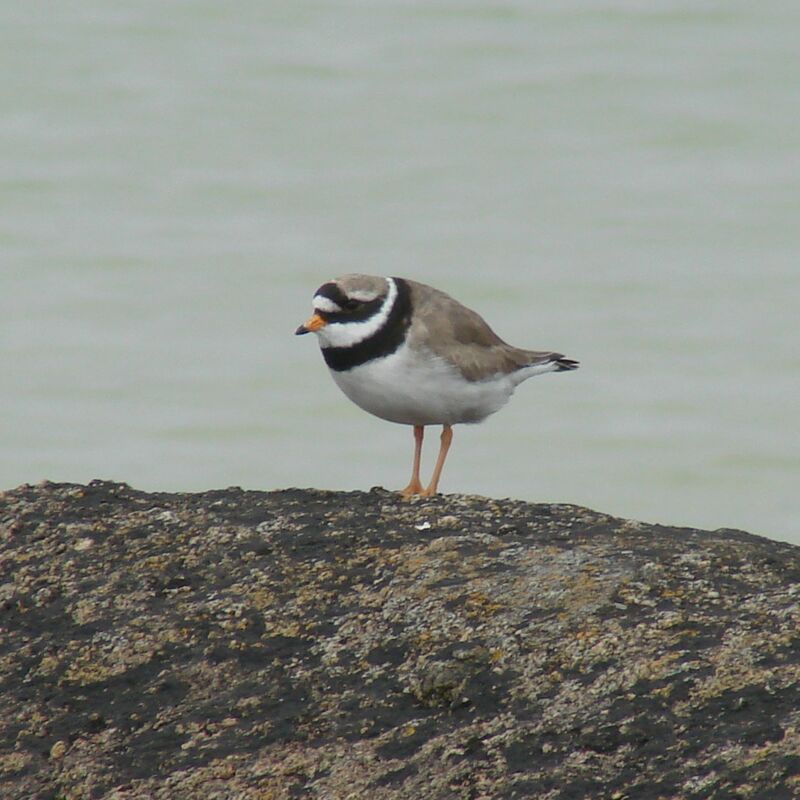 The Ringed Plover was looking particularly gorgeous today. 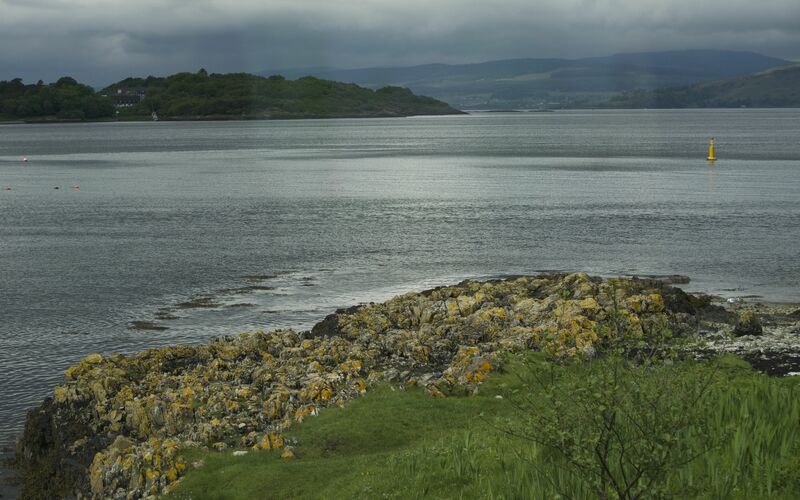 We dragged ourselves away eventually and headed off for Craignure, where we are staying tonight and from where the ferry leaves for Oban and the mainland. 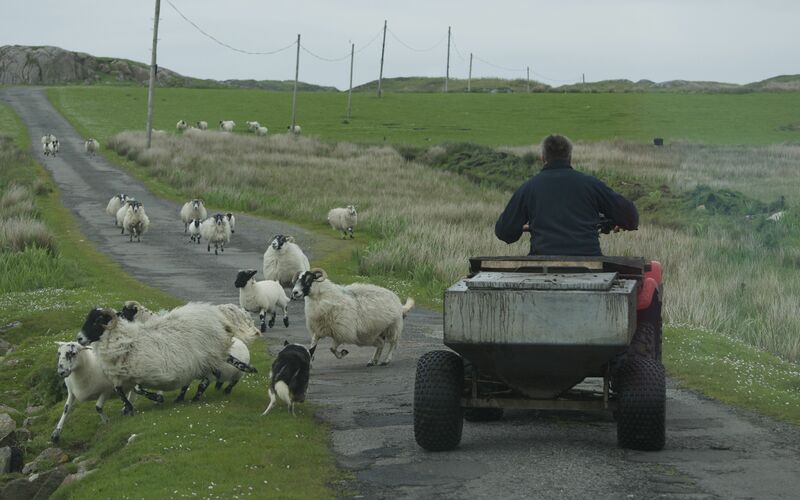 As we left the farm, the farmer drove out on his quad bike with feed for the sheep and instantly it was as if the call had gone out. 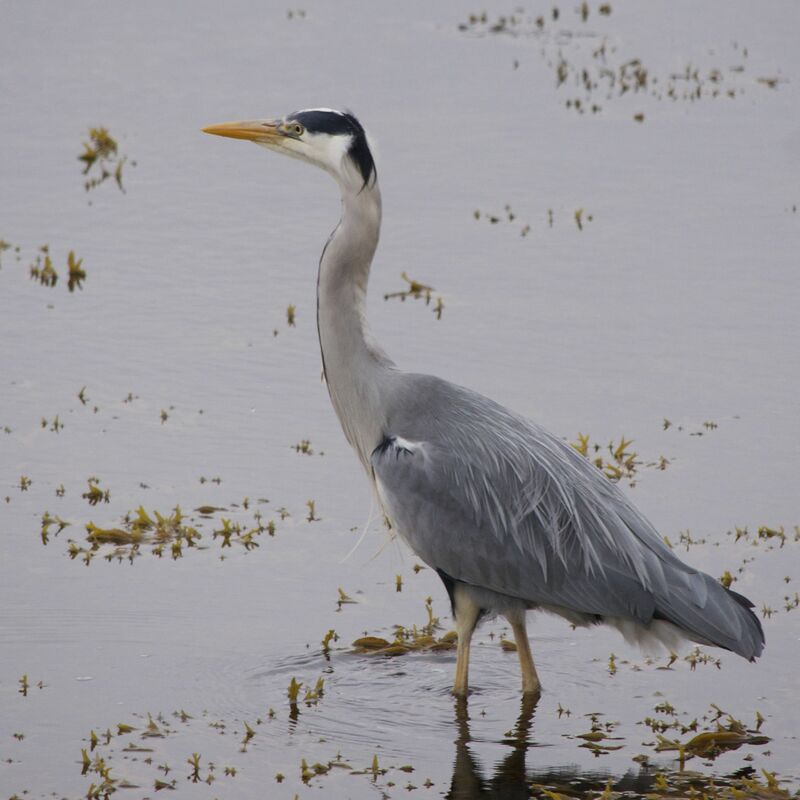 Driving towards the very small town of Bunessan we were lucky to spot this Heron doing a spot of fishing. And then a few hundred yards on Peter quickly stopped Bessie and grabbed the camera. Two large birds of prey were gliding above. 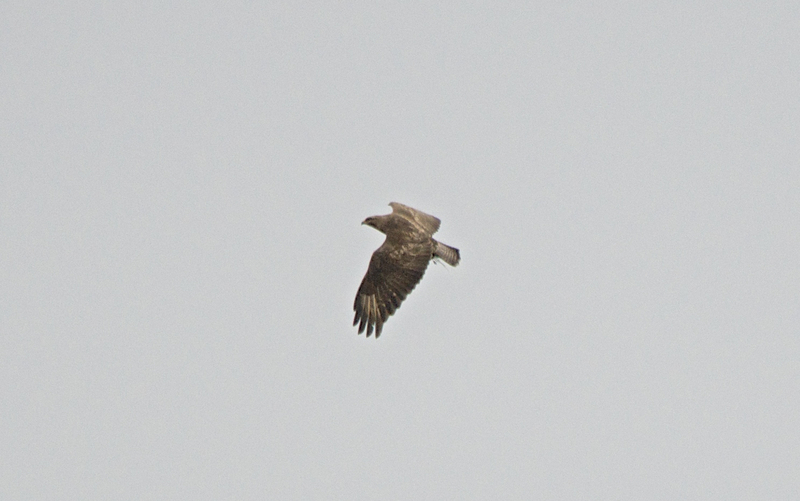 Not being sure whether they were juvenile Golden Eagles (or White-Tailed perhaps?) he took some photos but, of course they were pretty high up and we think perhaps they could have been Buzzards after all. Difficult to be sure. The rest of the journey was fairly unremarkable but in this part of the world there are always a few surprises. 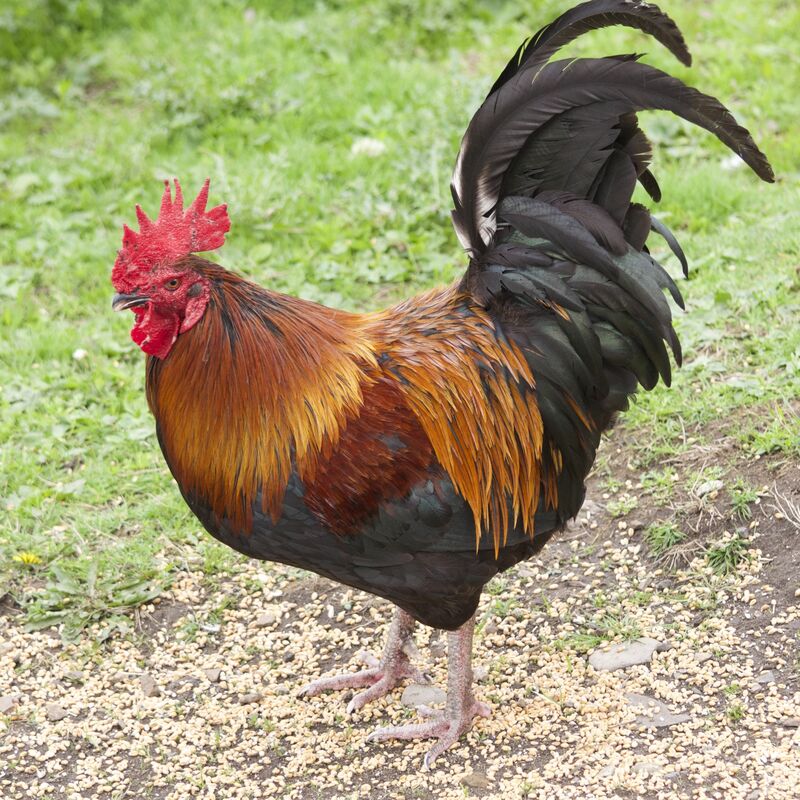 This proud cockerel really did cross the road – in front of Bessie and accompanied by a few ducks! We were pleasantly surprised when we arrived at the Sheiling Holidays campsite. 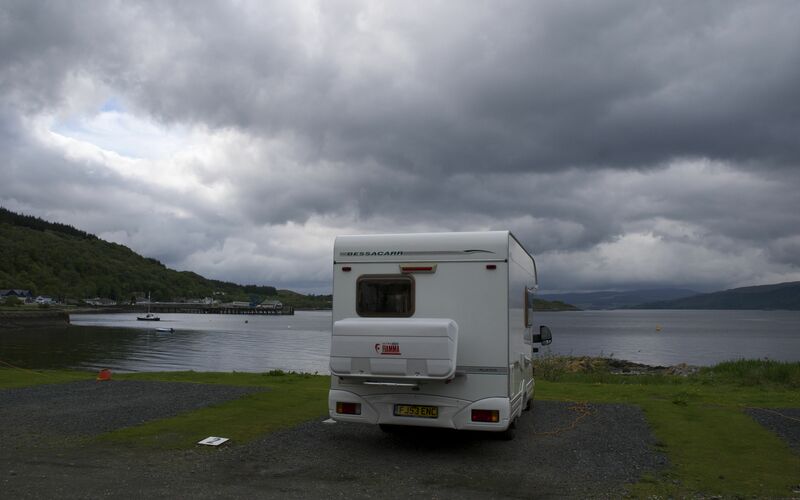 We were given an excellent pitch overlooking the water. We were also able to use their free wifi and made very good use of their washing machine and driers. We had decided that we would have a change from home cooking tonight (particularly as it is the birthday boy who normally does the cooking!) and went to the Craignure Inn for some local produce – a Glengorm steak, chips and the most enormous fried onion rings you’ve ever seen! 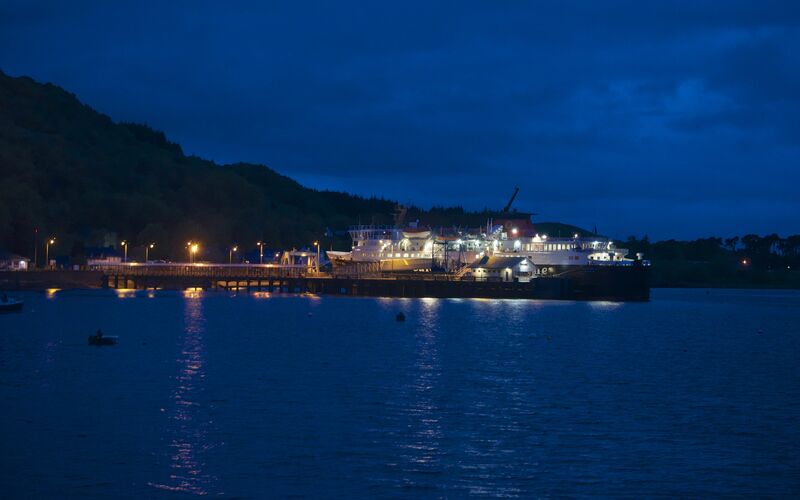 The final Isle of Mull ferry had arrived from Oban and it was obvious she was staying for the night. She was lit up like a cruise ship! 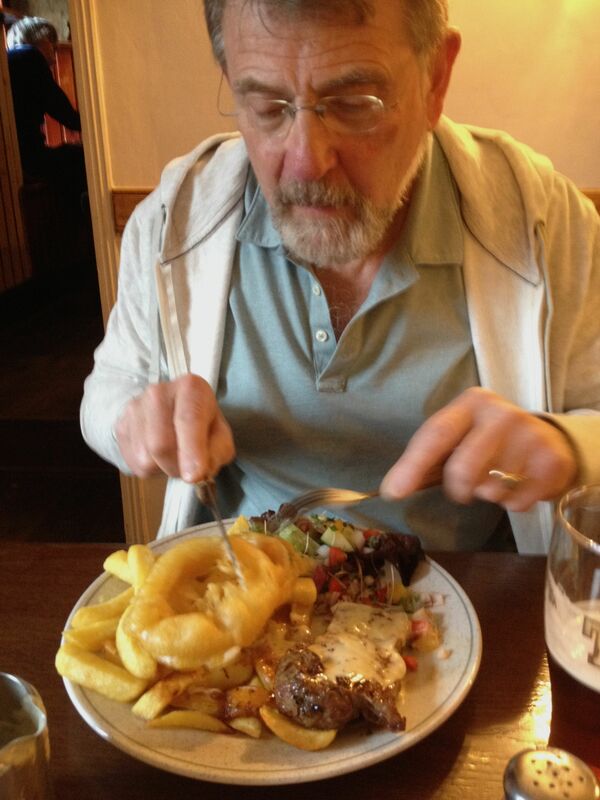 Glad Dad had a good birthday – those onion rings are huge! I want to know what happened when the sheep met?! 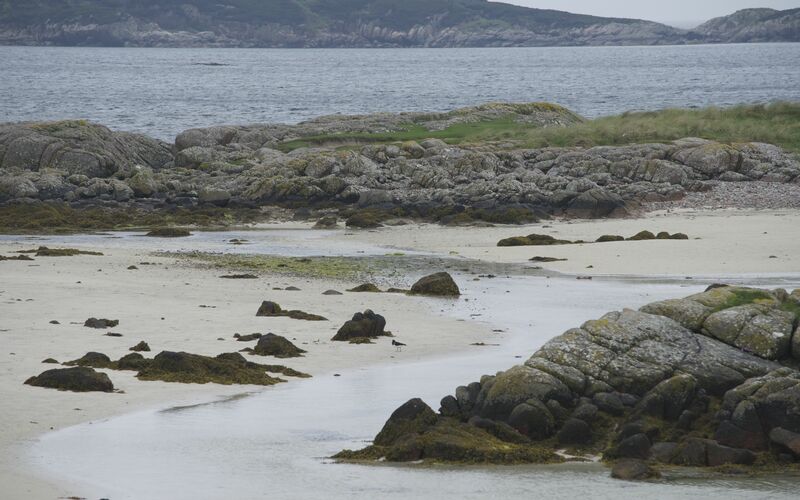 That beach looks perfect for rock-pooling. Hopefully you can change your warm hat for a sun hat soon Mum? As far as the sheep went, I’d like to report a more exciting conclusion but the fact was the farmer had cut across the field and all the sheep followed him! Made a good picture story though. 🙂 Watch out for the sunhats soon! Super Heron shots. I can still see the argument for Golden Eagle or Buzzard – still think Buzzard (at the moment!). Glad to hear Dad had a good birthday. Yay! A return of the brilliant hat! Also you were right about the onion rings grandma, they looked huge. 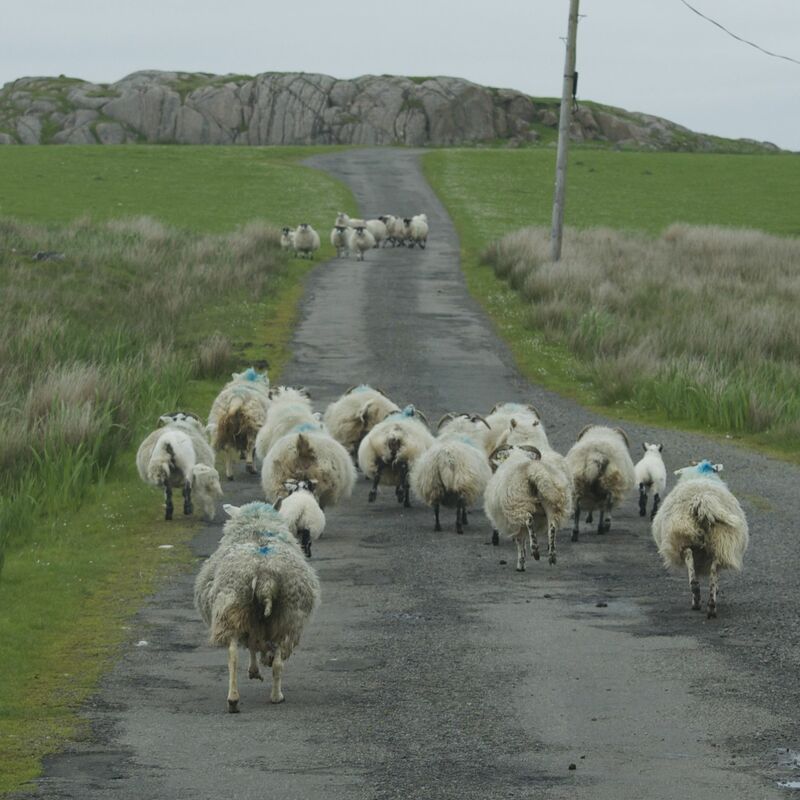 Scottish sheep are much more exciting than English sheep! Maybe it’s because there are more of them! Happy birthday 🙂 what a yummy dinner!